Cleaning is, for many of us, one of those chores we would happily do without. We can spend lots of money on a cupboard full of products which don’t actually get things any cleaner than a handful of inexpensive stock items. Maybe you have other things you’d like to spend that money on, and store in that space! The three main items to keep on hand are soda crystals, white vinegar, and bicarb. You can use the baking sort if you want, but it’s cheaper to get a box full from Home Bargains (Arm & Hammer, or Dri-Pak). The only difference (as far as I can discover) with baking bicarb is that it’s coarser so it would be slightly grittier. Clean windows with warm water with a drop of detergent and a good glug of white vinegar. I like to scrub with a sponge (it’s usually a long while since I previously did it!) then use a squeegee. Leave an open tub/box of bicarb at the back of your fridge, always, to absorb smells. Freshen your kitchen or shower drain with sprinkling bicarb down. Leave for 10 min, then add some white vinegar and leave a bit longer. Then rinse well with hot or boiling water. 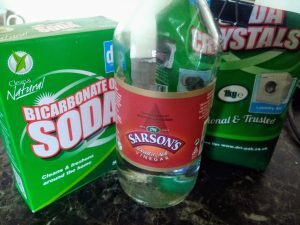 If it needs more serious de-greasing, sprinkle soda crystals down the drain, leave a couple hours, follow with some white vinegar (fizzes very usefully) then plenty of hot water. While you’re at it, bicarb is excellent for cleaning stainless steel, or glass oven doors, or something cooked-on to a pan, or dried on your worktop, and so on. Non-scratch scouring. Put white vinegar in the toilet bowl for an hour or for a day (depending on how scaled up it is) to dissolve the lime scale. Then scrub it off with a scouring sponge and clean inside and out. Repeat soaking if it doesn’t come smooth the first time. Vinegar is an excellent disinfectant and deodoriser. Use white vinegar in your laundry rinse, instead of fabric softener. Softener clogs up the fibres, needing more and more washing to get things clean, and vinegar helps strip out the build-up. Fill your tea pot with hot water, 1-2 Tbs oxy bleach or powder, and a handful of soda crystals. Leave teapot in the sink, it foams over! After a couple hours, empty and wash or rinse. Good for stained mugs and washing-up bowls, too. Smelly boat diesel on clothes? Soak in 50/50 white vinegar & water overnight, rinse and hang to dry. If it still smells, soak again and hang. When it no longer smells, put it through your normal wash.
Home-made shower spray – Spray on the wet surfaces of the shower (but not the floor) after the last person showers. The surfactants make the water run off, vinegar acts against lime-scale and soap scum, and the vinegar plus surgical spirit discourage mould growth – which leads (for me) to not having to clean the shower much at all. Happy cleaning, I hope you find these useful.